From @BalancingMama: So, you want to be a big-time blogger? My take on it, and what NOT to do. 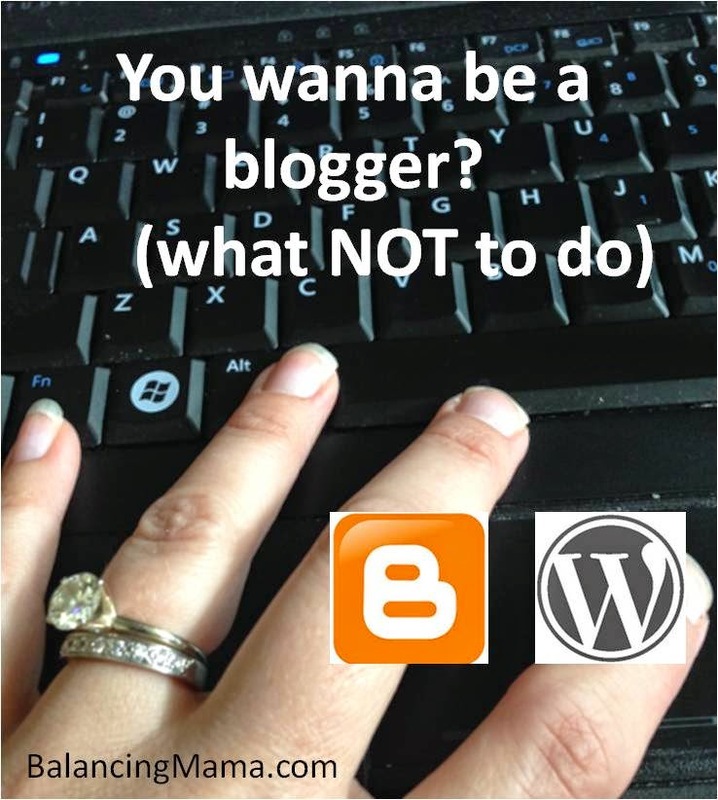 So, you wanna be a blogger too? You want to earn big bucks and prizes and a dozen trips around the world? Sorry, but I suggest that you keep dreaming. However, if you want to blog because you enjoy it and hope to get a few great contacts and an occasional sponsored post? It is doable - if you work at it. Don't plan your income before you have a site. I have actually seen this question before: "I want to start a blog - how do I make money?". My answer is: you can't. Unless you are one in a million (literally) with a completely unique style and voice that instantly goes mega-viral, you need to write for a while. You need to build quality content that people want to read. Use a bit of SEO smarts to help people find that content. Have patience. Define an audience and speak to that audience. If the content is good and unique, readers will come. If readers come, opportunities will eventually follow. But give it a couple years. Seriously... years. Don't beg for an audience. Don't visit other blogs and comment "this is my blog, follow me!" four hundred times a day. Don't beg. Beggars lack confidence, and who wants to read/follow/"like" someone who feels the need to beg for approval? Join link-ups on other blogs to share your own quality content. Promote your quality content on Facebook, Twitter, Pinterest, etc. Get to know other bloggers and form a tribe of like-minded writers who help share your stuff because they like it. Don't ask for contacts. In my opinion, it is unprofessional for any bloggers with direct contacts of PR reps to share that contact information broadly and publicly without the consent of the individual. I, for one, will never give out a rep's email address or phone number unless they have asked me to share. I work on the other side of the desk too, and I would not appreciate a bombardment of emails because my address was pasted on a board or tweet somewhere. You can do your own work to find contacts. Most websites have a press section with contact information. You can do an online search for press releases. Find companies on Twitter and connect there. Sometimes brand Facebook pages have an email address. Put in some effort, and you'll be surprised how many contacts you can find. Don't be greedy. If you are just starting out with relatively small numbers and no sponsors, don't sit on your throne and scoff at a $20 sponsored post. Don't stomp your feet and get angry when a brand asks you to accept a gift card or some product samples. No, you shouldn't set a standard of working for free, but you can't expect a bag of gold on day one. Often, I suggest that newer bloggers write about brands they love, something they bought for the home, a local attraction, etc., then use that post/pins/tweets to make a connection with relevant PR reps. You will begin to build a portfolio of that kind of writing, which will eventually help you to pitch and get noticed further. For most, blogging is a full-time job with a part-time income. The market is saturated with people willing to write about their favorite brands. For every you, there are probably at least 50 others. Understand your piece of the blogging world and accept whatever you can make of it. You will probably not get rich. I am able to do fun things with my kids, share products and causes I care about, and meet up with friends who are no longer just virtual. That's all I need, because I still do it for the love of writing.